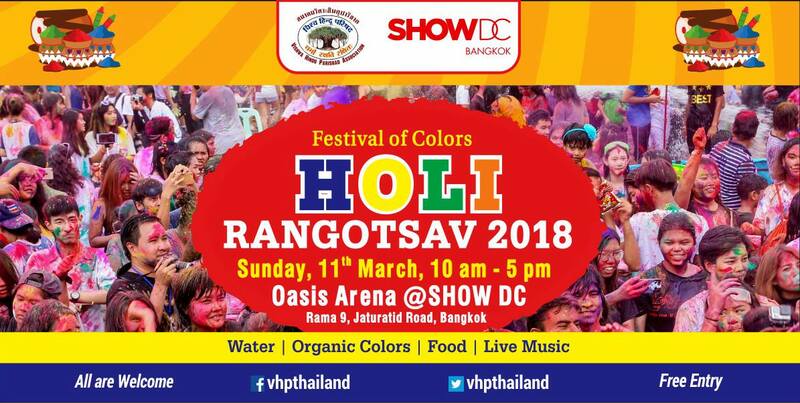 We invite all of you to celebrate Holi festival, which we call Holi Rangotsav. It is played with colors made from various herbal herbs which is put on to one another or add with water and splash on the other. This event will be held at Oasis Arena Show DC Bangkok on March 11th 2018 from 10.00am to 5.00pm. Color will be available for sale and those who register online will get 10% discount and 20% discount to students who shows their student ID card. Free Entry. Note: Do not bring in any kind of alcohol or intoxicated drugs in to the event. Also we do not recommend anyone to bring camera/camcorder into the event. This may cause damage to your equipment accidentally without knowing. Register online and get a discount on color.